I would suggest you wait a bit for the announcement of the new Intel MID devices, or even the Asus EEE PC (rumored to be a full ultra portable compact PC for $200). The new generation of UMPC’s is also clocking in under $600, so I guess waiting for at least 5-6 months will pay off big. A couple of weeks ago, I happened across the Asus Eee . It wasn’t able to get under $200, but the price ranges from $300-$500 depending on extras (mostly storage). I’ve been addicted the mini-computer. As you can see from the image it’s not much bigger than DVD case – and it weighs about 2 pounds. This is in stark contrast to my current laptop – a hulk with a 15.4″ screen and 8 pounds (not counting the huge brick of a charger). My current laptop has grown to be very slow. I should pare down some of the software, but I often find myself using a few obscure pieces every now and again. I should run fewer applications at one time, but I find that if I don’t have it open to work on right away, I’m not likely to touch it. The Asus Eee comes in a few different flavors. The first choice to make is whether you want the original (701) or the new version coming out this May 12 (the 900). I could probably get the 701 for around $300 – possibly even $250 if I find one Craigslist. It has one huge drawback preventing me from pulling the trigger – the screen is only 800 pixels wide – too narrow for many websites including my own. I would be scrolling on almost every web page that I visit. The newer version due in May, the Asus Eee 900, solves this problem by substituting the 7″ screen with an 8.9″ 1024-wide pixel screen. This is enough for many websites – and it comes in a design that doesn’t add bulk or weight to the new model. The new model adds a lot more memory and a few other improvements – most of which I consider nice, but none near as significant as the screen. However, it comes at a price – $549 to be exact. To confuse things even more, the computer comes in either Windows or Linux. The Linux version should perform a lot snappier, which is one of the key reasons for the purchase. However, it wouldn’t show movies from either Slingbox or Netflix like the Windows version. Lastly, Asus announced that come June it will start to use the newest Intel chip, the Atom. The Atom is highly anticipated because it runs at twice the clock speed of the current chip – while using less than one-tenth the power. It’s not known if this will be in yet another version at a higher price point, or if it will come at the $549 price of the 900, when the chip becomes available. Over the last two or three years, I’ve become usually very good with my technology purchases. I rarely have bought something just to find it become obsolete. I also have usually found a way to get by with what I have until what I want hits a fair price point. This has worked for a first generation iPod Nano, a Roomba, an audio/video receiver, and more in the last year. However, this is one case where the technology opens changes my life… I could walk down the street to the coffee shop and blog from there so I’m not inside all day. I could use the computer only for blogging allowing me to avoid the slow-down of my current computer. I would consider using it on a plane (with the WIFI off of course), or even if we were doing some overnight camping. Or maybe it ends up like the last travel computer I got, sitting in a drawer largely doing nothing 99% of the time. Why must technology decisions be so difficult? After a lot of internal debate, I think I’ve come up with a plan. I will sell my aforementioned travel computer. This should net me $150 or more for the complete package. I will then look for a slightly used original 2GB Asus Eee, which I’ve believe can be had on Ebay or Craigslist for around $250 ($50 off the new price). This means that the Eee will only cost me $100 in new money. I think I can kill my technology craving for more that a few months with this plan. At that point, increased competition will push the prices down and the features up. I should be able to get do the same sell and upgrade when that time comes. I’ve been using the Eee PC for a couple months now and I *LOVE* it! I got the 701 model right before flying out to LA and it was the best $400 I ever spent. (What’s also nice is that I had a ton more room in my laptop bag for other stuff) My wife, who doesn’t like using my old sluggish Windows laptop, also loves using the Eee PC to quickly check her email and casually surf the web. About the 900, one more major difference between them is that the Linux version will have a 20gb hard drive and the Windows will only have 12gb for the same price. The new line of eeePC’s look amazing. They fixed the only major thing I didn’t like about the first gen – the obviously-too-small screen. However, keep in mind the eeePC has a 2-2.5 hour battery life. For no moving parts and being small, this is really short (a friend of mine has a 10″ Fujitsu laptop that gets 7 hours). If you’re planning on staying at the coffee shop for more than 2 hours, or when you go camping, add in the fact you’ll need to carry the power adapter. I’m hoping this is something they’ll fix for the next go-round. Bigger and spare batteries are available on Ebay. Of course that adds to the weight, but I bet it would still come in lighter than the Fujitsu. Either way you have something else to carry. I still think that’s better than having a huge battery built into it and lugging it around all the time. As a budding blogger, I’ve wanted to find something small and portable to use at times, such as when I take my kids to the library, or if I’m sitting in a bookstore. I went to the local Sony store, and tried to type on a Mylo, and it was just too small. I’ve thought about a blackberry, considering how much work my peers do on there’s, but the more I’ve seen about the EEE, the more tempting it gets. I’ve been looking at an ultra portable too. My 15.4″ HP is just too bulky and gets about 30 minutes battery life now. I never paid attention to the Eee PC but the new line looks very interesting..I’ve got a tough decision to make as well, I think if I sold my HP for around $400 and just bought a macbook, I could kill two birds with one stone. I would have a fairly portable computer with a decent sized screen and battery life, and the processing power for all my needs. I’m very interested in the new Asus as well, but a bit concerned about whatever extra costs I’d end up with monthly for connectivity. Any idea what comes bundled with this and whether you’d need to pay extra to Verizon Wireless or someone for a mobile modem? 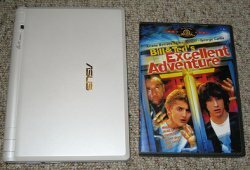 It’s very much a regular laptop, so there’s no special Asus Eee cost. It comes with wifi, but no bluetooth (you’d need to add it through a USB stick). It looks like you can add a USB stick for Verizon access (http://b2b.vzw.com/broadband/bbapccard.html), but I don’t see an unlimited data plan, so it could pricey. Sprint has the same thing with unlimited data for $60/mo – too pricey for me. I don’t know if those would work with the Linux version, so I’d read up for compatibility or just go with the Windows version. I’m waiting for eeePC to easily hack/add in a bluetooth receiver so I can put get rid of my N800 and use the BT GPS receiver that I bought for it on the eeePC. I jsut realized the eeePC would be perfect for programming on the road or getting some work done. The N800 only allows me to watch media since typing on a virtual keyboard is a pain. Also, for the 20gb/12gb version, couldn’t you buy the linux version and reformat it into windows if you really want? You should be able to add bluetooth through the USB port. It’s a little clumsy vs. having it built in, but it can be GPS if you want that. I think a lot of the techies will go with the 20GB linux version and install Windows. Of course you have to have a copy of windows around, or you are going to have to buy it yourself (so it’s more costly that way). I have the 2g EEE Surf with the 7 inch screen and Linux ($299). His name is Moco. I really, really, really like this as a travel computer. Matter of fact, later this evening I will be hauling Moco out to Nearby Coffee Shop to work some more on my novel. The tiny keyboard does take some getting used to, but I have small hands and if I need to get down to serious typing, I plug in a full sized USB keyboard I got from Goodwill. The biggest problem I have is with the screen size, 7 inches is fairly small and I will sometimes get eye strain. From staring at the screen for eight hours. If all you need is something to do some word processing and wifi surfing, I highly recommend the EEE. Thanks for giving me a shout out! I bought the ASUS EEE PC 701 4G on my trip to Malaysia in November, so I have been using it for around 7 months. This is easily the best gadget I have ever owned! I don’t do much writing, just lightweight browsing and chatting, no heavy weight stuff. This thing is perfect for my use cases! I hope you enjoy your EEE as much as I enjoy mine! I will also chime in that I’ve had my EEE PC for about a month and I love it. I have the original linux version. Yes, the keyboard is small, but the biggest problem I’ve had is the right-hand shift key is over farther than normal. I usually only get tripped up typing when I add an apostrophe or occasionally on a capital letter. There is nothing special you need to connect to a wireless internet. In fact, it is much easier than any other computer I’ve used. I’ve only come across a few websites that the small screen has been a problem, and some of the games are pretty addicting. It comes complete with Open Office, which is completely compatible with MS Office. Very portable, and for you ladies, there is a good chance it will fit in your purse without any problems. Seriously considering buying this or the Acer Aspire. This laptop might last another 3 years, but not with the kind of heavy use I’ve been giving it. Plus, I want something very portable (which this isn’t) so I can write on the metro, etc.